The world is moving toward the cloud—both public and private clouds—and infrastructure demands are giving rise to a new generation of integration platform-as-a-service (iPaaS) API servers which specifically handle this use case with the added dimension of cloud versus your own datacenter. Node.js is powering these new iPaaS products because it’s dynamic, highly scriptable, and high-performance. Node hits the sweet spot because it enables developers to glue together disparate pieces of legacy infrastructure and quickly surface an API for next-generation web and mobile applications. Ultimately, it promises to address the emerging requirements for the internet of things (IoT). OpenShift is one of the most popular PaaS (Platform as a Service) provider used by developers worldwide. OpenShift supports Node.js and StrongLoop API server platforms with default built in cartridges. On-premise – take control of your BaaS and run it in your datacenter or on your own cloud infrastructure. 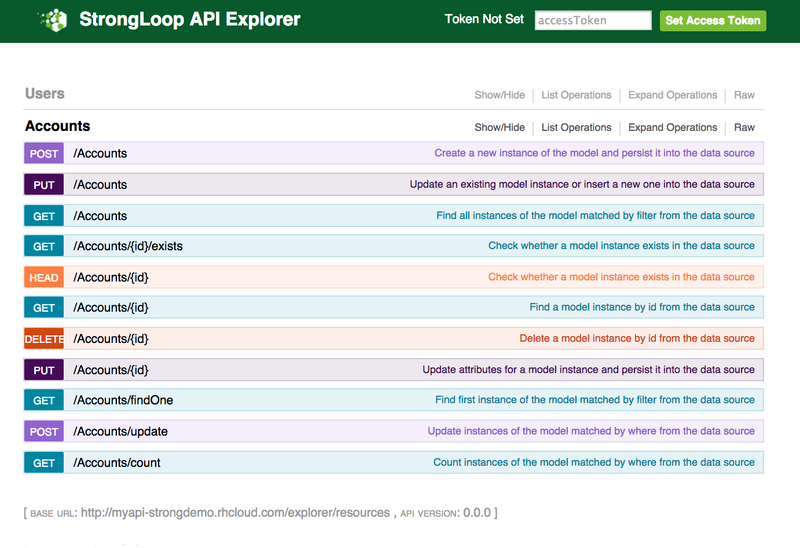 Powered by LoopBack – the leading, open source API framework project built 100% in Node.js . Built in mBaaS with Push , Geopoint , Social Login, Storage, etc. Replication – client to server, server to client, app to app and database to database. Connectors to interface and autodiscover new and existing datasources including RDBMS, NoSQL and proprietary backends. Controller to automate DevOps tasks like clustering, debugging, log management, build and deploy. Monitoring to provide deep application performance visibility and deep profiling in production. Login at at http://www.openshift.com/. Create an account if you don’t already have one. Ensure you have the latest version of the client tools. As part of this process, you’ll run the rhc setup command and choose a unique name (called a namespace) that becomes part of your public application URL. For example On OS X, you’ll need to install either the Full Xcode Suite – or – git for OS X. These packages ensure that Ruby and Git are installed and configured. Using your OpenShift login and password, run $ rhc setup to connect to OpenShift and create a unique namespace for your applications. The authenticity of host 'myapi-strongdemo.rhcloud.com (107.20.8.255)' can't be established. Select “yes”, which will deploy the app finally to OpenShift as well as clone a replica of the deployed app on to your local machine. Warning: Permanently added 'myapi-strongdemo.rhcloud.com,107.20.8.255' (RSA) to the list of known hosts. Your application 'myapi' is now available. Run 'rhc show-app MyApi' for more details about your app. Clicking on the app name lets us see the provisioned specifications of the host system, remote url information as well as gives us options to add multiple backends like MongoDB, MySQL or PostgreSQL to this API application. Let’s open a browser and type in the /explorer, which in our case would be <http://myapi-strongdemo.rhcloud.com/explorer>. Now let’s try to update this API application by adding some custom models and API endpoints. 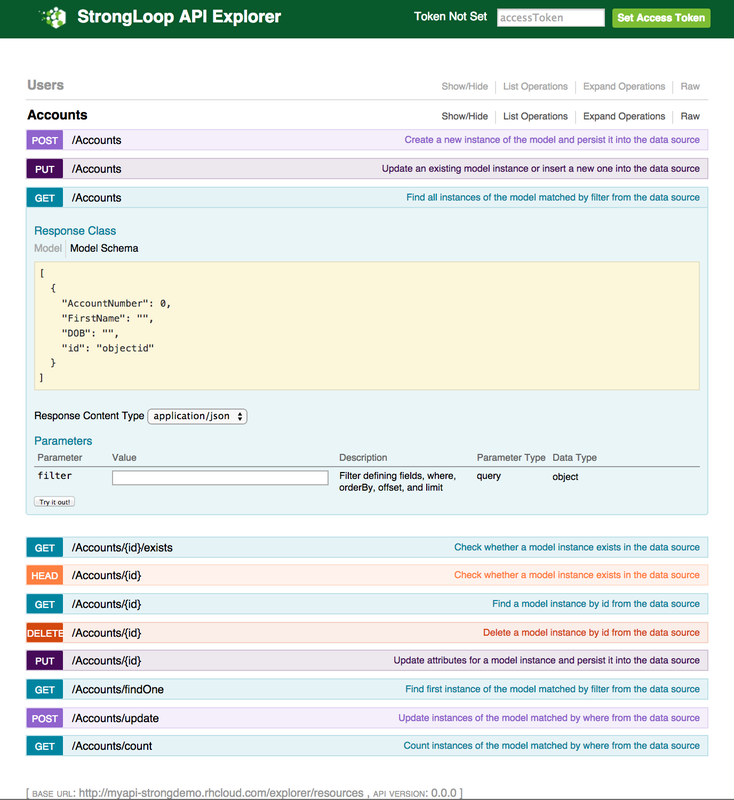 First of all, we will create a datasource for myAPI application.We will start with a MongoDB type datasource. As Loopback supports MongoDB out of box from it’s large list of connectors, we will choose the default connector type for our datasource. As prompted, we can choose to expose the created API over REST and also provide a custom plural name for the account model. We can now add model properties following the prompts and also if the model follows backend schema validation by setting the “required” property. Let's add some Account properties now. Similarly we will define additional properties of this model. Let's add another Account property. We will also install the MongoDB connector module of LoopBack as that is a required dependency for the model to work. We can now validate the updated myapi application on OpenShift cloud by refreshing the same API explorer URL and checking for the accounts model. First off we can see the new Accounts model (pluralized) being added. 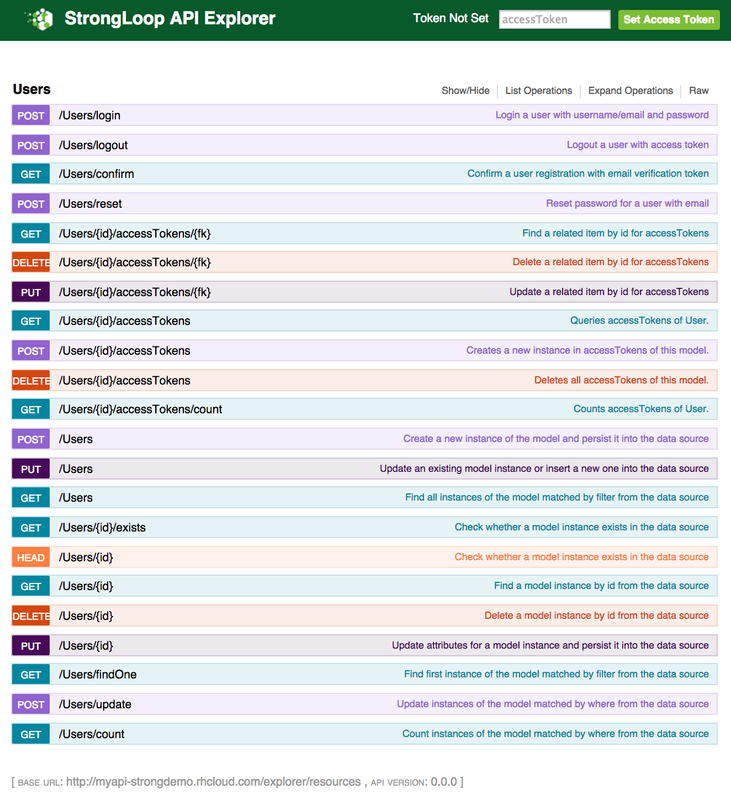 Expanding that API, we can also see all the auto-provisioned API endpoints for CRUD operations on Accounts model. The endpoints can actually be tested and executed through this interface. Here we see a “Get” operation.